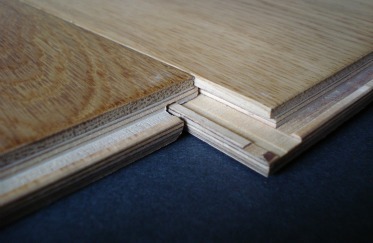 A click joint is a very precise method of joining two floor boards together. It is normally seen in laminate flooring but is also widely available in thinner engineered hardwood flooring. In a click system the tongue of the floor board being laid is presented to the adjacent board at an angle of around 30 degrees of arc and then clicked flat. At the same time the notched end tongue locates snugly into a correspondingly notch on the end of the previous laid board in the same line. The resultant precise joint holds tight together, meaning that no glue needs to be applied to the joints. The floating floor, even considering the constant, although slight, expansion and contraction in service (due to ever present changes in relative humidity between day and night and between seasons) remains tightly jointed and does not gap. The removal of the need for gluing joints offers significant time savings in fitting. This results in cost savings that, in most cases, will more than compensate for the modest additional cost per square metre of the click system of flooring over a traditional glued T&G system.